1. Pull up a stool. Watching the chef at the grill is half the fun — encourage spectators by setting up a bar-height table and stools near the grill. 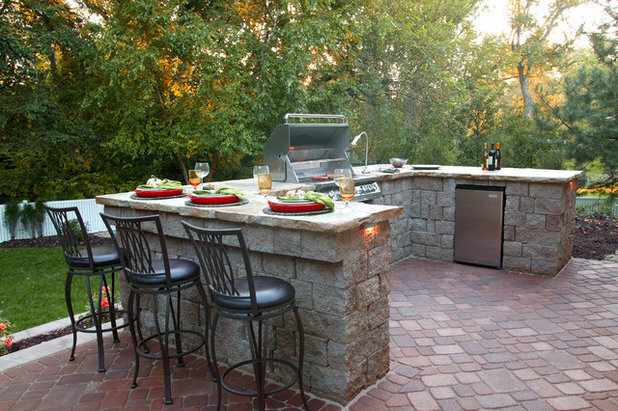 Go for a built-in, like the gorgeous stone version shown here, or just set up a bar-height outdoor table and chairs. 2. Accent with steel for a modern look. 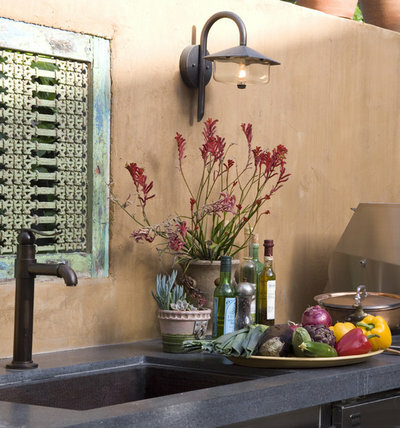 Lots of outdoor kitchens use stone and wood (which can be beautiful), but modern spaces cry out for something sleeker. 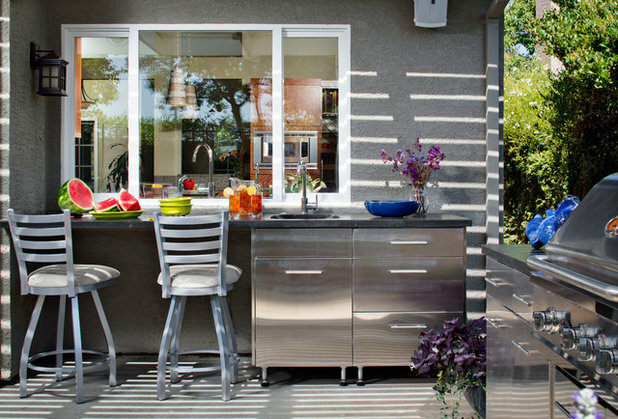 Stainless steel counters are a great fit, and galvanized steel Tolix stools bring a little industrial cool. 3. Add a prep zone. 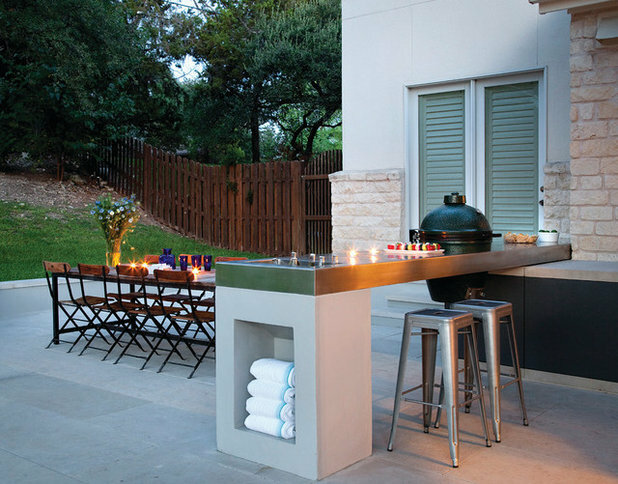 Whether you have an outdoor sink plumbed or simply add a freestanding work table, a well-positioned prep area is what will transform just a grill into a true outdoor kitchen. Be sure to include an easy-clean work surface and some storage for frequently used tools. 4. Stay cool with a big umbrella. An extra-large freestanding umbrella offers more flexibility than one attached to the table. 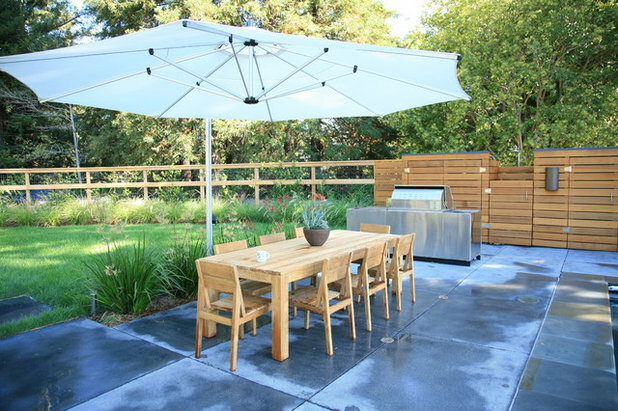 Use it to shade the prep area (keeping food out of the sun), then move it to cover the eating area when it’s time to sit down. 5. Make your grill a mini destination. 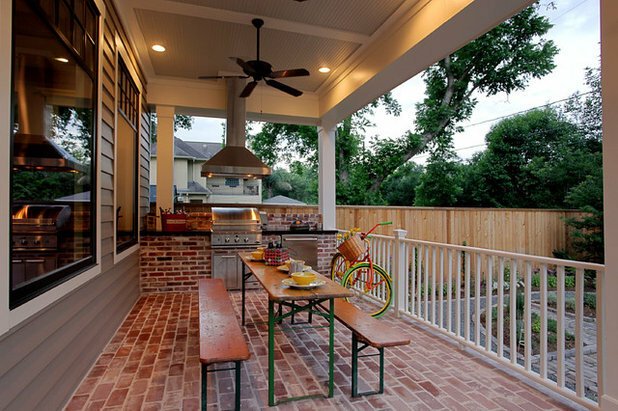 While you will sacrifice some convenience, locating your grill and eating area away from the house can make eating al fresco feel like a getaway. Take advantage of a great view, flip burgers by the pool, or hide away in a secluded garden nook. 6. 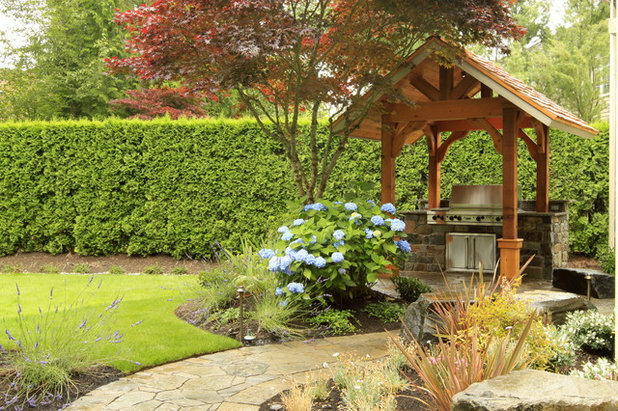 Add a roof for all-weather cooking. If your grill is out in the open, consider adding a shelter to protect the cook in a sudden downpour. Just be sure that any structure is a safe distance from the grill to avoid fires. 7. Cook campfire-style. Is roughing it more your style? 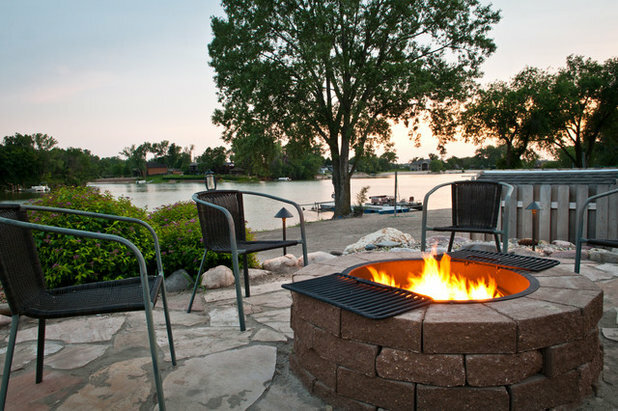 Forgo the fancy grill entirely in favor of a stone fire pit with attached grilling grates. 8. Try window service. 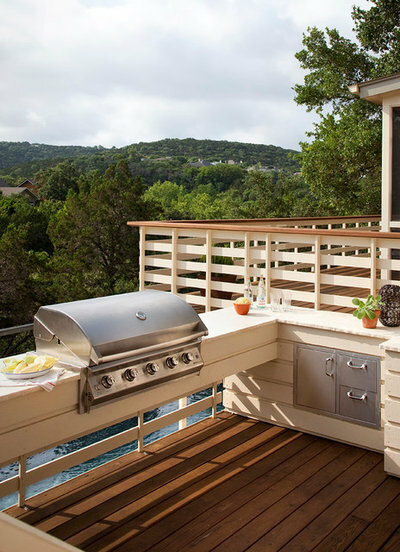 If your grill setup is near the house, a pass-through to the kitchen can be extremely handy — and fun! 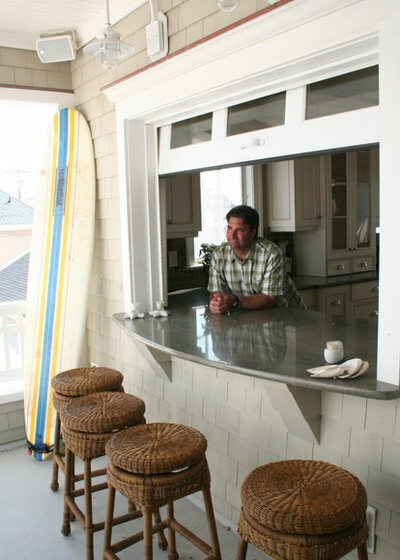 Pull up a couple of stools on the outside, and you’ll have your own little bar, too. 9. Consider a mini fridge. If you cook out a lot, it may be worth it to add a small fridge to your grill area. It’s perfect for keeping meat at hand yet out of the sun — and for storing icy beverages for the chef. 10. Slim down furniture. A slender table with bench seats will fit the most guests in tight quarters. If you really need every spare inch, choose benches that can tuck under the table and push the whole thing against the wall when it’s not in use. 11. Maximize your space. Having something built in to exactly fit a space is ideal, because you won’t waste an inch. 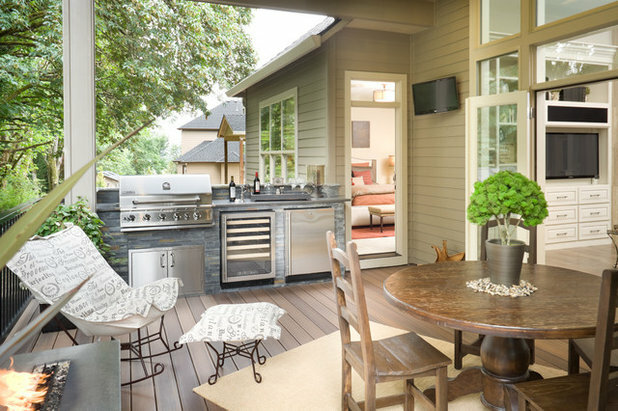 The outdoor kitchen shown here was ingeniously built right into the deck railing for a sleek look that really maximizes the space. 12. Accessorize. Gather ingredients on a pretty tray (bonus: It’s great for carting items from the house), deck out the prep area with a few potted plants and keep frequently used sauces and oils within reach. 13. Set a mood at night with lighting. 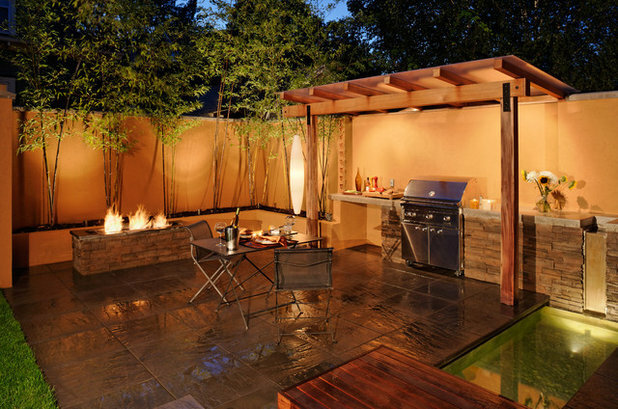 A combination of landscape lighting and direct lighting over the grill area will offer the right balance of function and ambiance. Tell us: Are you updating your grill setup this summer?